This time next week, the CEC/CASE Legislative Summit will be in full swing! The major "tag" we have been using to promote this major advocacy event is "What happens in the classroom is too important to stay in the classroom! It needs to be shared on Capitol Hill." It is not too late to register and join the over 160 people from over 35 different states, just click here for more information and to register. It is our responsibility to educate our congressional members on just what does go on in the classrooms and our schools! One of the first things you need to do as you make your plans and calendar for this upcoming year is to check out your congressional delegations' schedule and schedule invites for them to visit your schools, programs, and more importantly classrooms. When they come, have the data to back up the performances of the students and staff. Make it a photo opportunity and have parents attend too. What happens in the classroom is too important to stay in the classroom! If you attend the Summit, you will learn how to not just advocate up on the Hill in July but how to advocate all year long in your community. These advocacy skills are important to our students, parents and our programs. Don't neglect your own professional development on this very important leadership skill! And speaking of professional development... The early bird registration for the CASE 26th Annual Fall conference: Continuing to Take Care of Business is now open on the CASE homepage! The registration for the conference will never be lower than it is from July 1- Aug. 1! What an amazing opportunity to learn from 3 outstanding keynoters who all specialize in specific strategies to apply in your setting as well as picking from the 48 breakout sessions! We are thrilled to have Drs. Frances Stetson, David Bateman, and Martha Burns as our keynote speakers. Watch for more details as the date gets closer but don't wait too long to get this great price on the Early Bird registration and to get your hotel room at the Atlanta Hyatt Regency! Click here to reserve your hotel room and remember to use the code "case." Are you feeling Lucky? As you think about all the preparation for this coming year, consider the great little "Lucky 21" booklets! These are short monographs you can use as needed for various short professional learning opportunities! The topics include: Avoiding Legal Disputes in Special Education; Section 504: Myths and Realities for School Personnel; Restraint and Seclusion in Schools; Response to Intervention; Discipline of Students with Disabilities; and Personnel Development in Special Education. Each booklet has 21 essential points/questions to really give a great overview on each of these topics and did we mention they are only $5 each?! And there is a discount if you purchase 26 or more of any one booklet! Check them out on our website and order yours today! 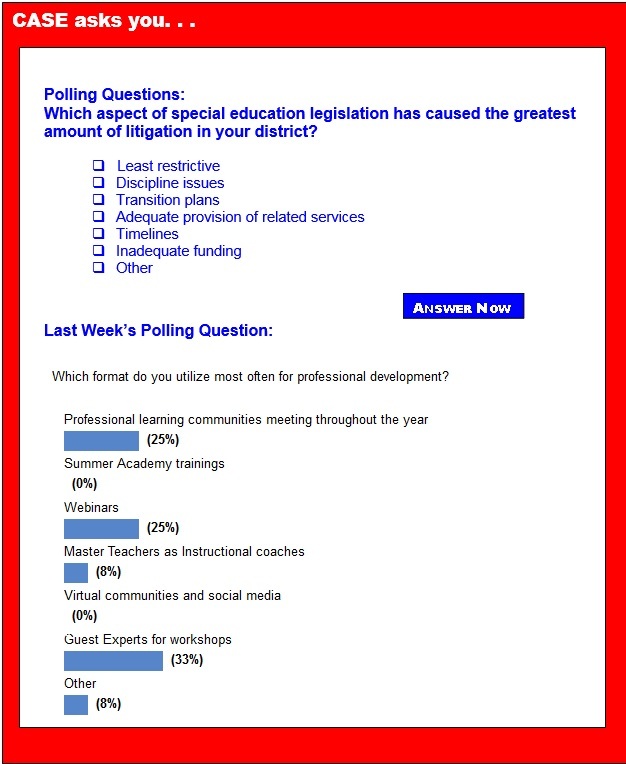 Last Week's Poll asked, "Which format do you utilize most often for professional development?" Of those answering this week's poll, 33 percent said the type of professional development they use most often is the guest expert workshop. Second place was a tie between Professional learning communities meeting throughout the year and webinars at 25 percent. There was another tie at eight percent using Master Teachers as Instructional coaches and "other." As we said last week, it isn't too early to start planning your professional development. Special thanks to our Sponsor, Event Gold Partner and Partners for the 2015 Special Education Summit! The four-day 2015 Special Education Legislative Summit, July 12-15, is for teachers, administrators, teacher educators, early interventionists, researchers, teachers in training — anyone who passionately supports improved developmental and educational outcomes for students with exceptionalities and the professionals who work on their behalf. Capitol Hill Day will show decision makers in Washington how your work pays off in successful students who are college and career ready and make important contributions to their communities. On Friday, July 24, 2015, in celebration of the 25th Anniversary of the landmark Americans with Disabilities Act, the U.S. Department of Education's Office for Civil Rights will bring together policy and program leaders, community organizations, and youth to examine current implications of the ADA's implementation and cross-cutting issues with other federal civil rights laws, and plant the seeds for the next 25 years of achieving new milestones to advance civil rights for people with all types of disabilities. To unite thought leaders with today's up-and-coming generation of youth and young adults with disabilities, the event will consist of three parts. Contact www.mslbd.org "School Leaders’ Conference" for session descriptions, registration and hotel information. Early Bird discounts are available through Sept. 25, 2015. Teams of 3 or more receive a 15 percent discount. This is a conference you don't want to miss! From NCLB to IDEA to FERPA, we see the impact of decisions by Congress on a daily basis in our schools. Too often, the voices of teachers and administrators are absent from the table when these momentous decisions are made, though their wisdom and experience are imperative to making them work. For those who are interested in joining the policy debate at the state or federal level, a new report (Teacher Voice: The Current Landscape of Education and Policy Expert Communication) may help. Through case studies and survey results, it explores how educators and policy experts currently communicate and offers tips for teachers and administrators hoping to get more involved in policy discussions. To learn more about The Raising of America, you can also visit the website at: http://www.raisingofamerica.org/documentary. July 1, 2015, marks the day that many of the provisions of the Workforce Innovation and Opportunity Act take effect. This new law has the potential to make a tremendous difference for tens of millions of workers, jobseekers and students across this country. WIOA's transformation of our publicly-funded workforce system means that all of us — federal and state partners, governments, nonprofits and educational and training institutions, must be pressing for innovations. The National Center on Educational Outcomes at the University of Minnesota recently released their sixteenth report. This report analyzed how states publicly report online assessment data for students with disabilities in K-12 schools across the United States. For the report, researchers explored websites for the 50 states, the District of Columbia and 10 other areas including Puerto Rico and the U.S. Virgin Islands. In what is likely to be a controversial report, researchers from Pennsylvania State University just published a study that investigated whether minority children attending U.S. elementary and middle schools are disproportionately represented in special education. The researchers found that, contrary to widespread concerns that minorities are disproportionately identified to receive special education services, Black and Hispanic students are less likely than their white and non-Hispanic peers to be labeled as having a disability, when factors such as household income, low birth weight and parents' marital status are taken into account. When educators plan Individual Educational Programs for students with learning disabilities, they use several key considerations for possible instructional and test accommodations to help students improve their individualized learning. Educators choose accommodations from areas such as pacing and timing, environment, assignments, scheduling, test adaptations, etc. One area that is not often considered as a possible accommodation is noise control. Over the last five years, Congress has cut federal funding for K-12 education by nearly 20 percent, about five times more than overall spending cuts, according to a new report. In an analysis of the federal budget released Wednesday, the bipartisan advocacy organization First Focus found federal spending that affects children — including funding aimed at preventing child abuse and neglect, for housing allocated to children, and for programs targeted toward homeless youths, as well as education funding — has dropped 9.4 percent since 2011, when federal stimulus funds ran out. Overall federal spending dropped 4 percent in the same time. In what’s believed to be a first, a new law in Texas will require schools to install cameras upon request in classrooms serving students with disabilities. The law signed by Gov. Greg Abbott earlier this month mandates that school districts and open-enrollment charter schools in the state employ video cameras if they are requested by a parent, trustee or staff member. Under the measure, such requests can only be made for self-contained classrooms and other environments where the majority of students are receiving special education services. The U.S. Senate is slated to start debating a rewrite of the Elementary and Secondary Education Act. One of the big points of contention to watch? Expanding school choice. And that prospect does not make a coalition of more than 50 organizations — ranging from AASA, the School Superintendents Association to the Texas Freedom Network very happy. Those organizations sent a letter to lawmakers reiterating their opposition to vouchers and Title I portability, which would allow federal money for disadvantaged children to follow students to any school they choose. Decades of research have demonstrated that working in small, structured teams — that is, cooperative learning — is one of the most effective ways for ADHD students to master the curriculum. And kids who learn cooperatively typically make significant social and academic gains. Of course cooperative learning can be challenging for students with attention deficit disorder. These kids may veer off-topic repeatedly, frustrating others in the group — or have trouble meeting deadlines or taking guidance from others. Chris Elsworthy, a contributor for eSchool News, writes: "I had always been good at building or 'making' with my hands. Whether it was helping my dad with repairs around the house or building model airplanes, I found tremendous focus and inspiration with these types of projects. The classroom was another matter. Throughout my time in school, I struggled greatly with traditional learning methods. My teachers quickly became frustrated with my lack of enthusiasm and focus on my work. Most assumed I was unintelligent or lazy. It wasn't until I was diagnosed with dyslexia at the age of sixteen that things began to change." Kyle Hoopes, a contributor for Connected Principals blog, writes: "I was just recently issued a challenge by a good principal friend of mine, Adam Welcome, to post ideas around specific topics each week. I think it is a wonderful idea. We have the opportunity to reflect each week on important ideas and share each other's thoughts. Last week, Adam posted a great blog on making schools great by addressing the idea of why students may not like coming to school. I've thought about this idea for a week and I have a few thoughts." Math is a lot less scary when you have a "fearless frog" at your side. To help her students feel less anxious about math, Jennifer Laib used a toy stuffed frog to talk about math fears. The K–8 math specialist at Driscoll School in Brookline, Massachusetts, asked second-grade students what it meant to be "fearless" in math. Students offered up concepts like "Ask questions" or "Believe you can do it." When students modeled those fearless traits, they were allowed to hold the fearless frog. The result: Kids were excited at the prospect of learning from their mistakes in math instead of fearing them. There just a few hundred students at the public schools in Saint Paul, Arkansas, a speck of a town nestled north of a national forest. Many of these children don't have an Internet connection at home, the principal of Saint Paul schools, Daisy Dyer Duerr, said. An after-school program established here three years ago here provides an Internet connection, enrichment lessons and transportation home. Children who sign up stay for three hours after school, she said. Graduation season is here and thousands of students are preparing to enter the “real world.” The majority of them will spend this summer getting ready for college or starting new jobs. But for many with autism, the future doesn't feel so bright. New data from the National Autism Indicators Report reveals that one-third of young adults (ages 18-25) with autism don’t have jobs or attend college. Only 19 percent of young adults with autism have ever lived independently from their parents, compared to 60 percent of their typically developing peers. Recent reports suggest that 95 percent of American teenagers use the Internet, with 85 percent of this group using social media. More than half of adolescents were also found to log in to a social media website more than once a day, with 22 percent logging in to their favorite social media portal more than 10 times each day. Because adolescents are at a stage in their development when they are vulnerable to peer pressure and have limited capacity to self-regulate, there is concern over the potential risks of social media use among this group, including the potential for cyberbullying, online harassment and privacy issues. The following Notice of Proposed Priority — Rehabilitation Training: Vocational Rehabilitation Workforce Innovation Technical Assistance Center was published in the Federal Register on Wednesday, June 17. Summary: The Assistant Secretary for Special Education and Rehabilitative Services proposes a priority to establish the Workforce Innovation Technical Assistance Center. The Assistant Secretary may use this priority for competitions in fiscal year (FY) 2015 and later years. We take this action to provide training and technical assistance to State vocational rehabilitation agencies to improve services under the State Vocational Rehabilitation Services program and State Supported Employment Services program for individuals with disabilities, including those with the most significant disabilities, and to implement changes to the Rehabilitation Act of 1973, as amended by the Workforce Innovation and Opportunity Act, signed into law on July 22, 2014. Dates: Comments due on or before July 17. The following Notice of Proposed Priority and Definitions — Rehabilitation Training: Vocational Rehabilitation Technical Assistance Center-Targeted Communities was published in the Federal Register on Friday, June 26. Summary: The Assistant Secretary for Special Education and Rehabilitative Services (OSERS) proposes a priority and definitions to fund a cooperative agreement to develop and support a Vocational Rehabilitation Technical Assistance Center for Targeted Communities (VRTAC-TC). We take this action to focus Federal financial assistance on an identified national need. We intend the VRTAC-TC to improve the capacity of State vocational rehabilitation (VR) agencies and their partners to increase participation levels for individuals with disabilities from low-income communities and to equip these individuals with the skills and competencies needed to obtain high-quality competitive integrated employment.